Salt is a normal component of many fish systems. Saltwater and brackish systems require salt on a continual basis. But what about freshwater systems? Some internet pages recommend keeping salt in koi/goldfish ponds/tanks at all times. Others say don’t bother. What are the effects of salt on an all-freshwater species? In a freshwater environment, a fish’s body is more dense than the surrounding water. As a result, water is constantly trying to enter the fish’s body and achieve osmotic homeostasis. A fish’s gills, kidneys and urinary systems are responsible for removing the excess water. When these mechanisms are compromised, the clinical manifestation of “dropsy” can occur. By adding salt to the water, you are changing the osmolality of the environment surrounding the fish, thereby decreasing the amount of water diffusing into the fish. Some people figure this is less stressful for a fish, but after millions of years of evolution, it really isn’t necessary. A fish’s body can handle the metabolic demands of freshwater. It’s the human equivalent to drinking less water so your kidneys don’t have to work as hard. Most salt-avid fish keepers will keep their fish in very low salinities: 1-1.5%. This level can be very hard to test accurately for and will often vary between 0-3%. This level will not hurt your fish. If you feel like you NEED to have salt in there, that’s fine, but you should not strive for levels greater than 2%. You do NOT HAVE to add salt to your freshwater fish system. Always add non-iodonized salt (not table salt)! For some parasites, depending on the species and water temperature, higher therapeutic levels of salt can be used to treat the infestation. Salt works by first increasing, then depleting the mucus coat, which many parasites use as a food source and for protection. Once the mucus coat is gone, the single-celled parasites rupture from the changing osmotic gradient. But if you are slowly bringing your salt levels up without realizing it, some parasites have been found to become resistant to therapeutic salt levels, requiring treatment at even higher doses. The higher the salt dose, the harsher the treatment for the fish. All in all, a little salt is fine, but don’t obsess over it. Your fish will do just fine without it. The only time we recommend salt is for recovery from trauma or surgery. Don’t forget that salt can kill aquatic plants! Well, all fish have swim bladders, so that fact is correct, but it is not a disease. “Swim bladder disease” is most common in goldfish and koi, with a high percentage in fancy varieties of goldfish. For 99% of koi, swim bladder disease is caused by poor water quality. I have had one case of actual swim bladder disease in ONE case, shown below. For this koi, her swim bladder is full of an sterile, non-cellular fluid. We don’t know why this happened, but it causes her to scoot around on her belly. But this is our ONE case of an actual swim bladder issue in a koi. 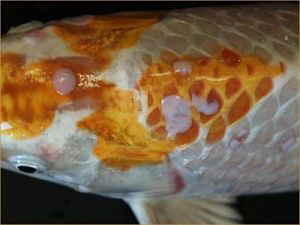 We have had two instances of koi with tertiary swim bladders, but not causing any clinical signs. Goldfish are supposed to have a two chambered swim bladder, but due to their anatomy, these fancy varieties have limited space in their coelomic cavities. This sets them up for buoyancy issues from birth. Goldfish and koi are also physostomous fish, meaning that they inflate their swim bladders by having a pneumatic duct between their esophagus and swim bladder. When they eat at the surface, it encourages air to enter the swim bladder. This is the main reason we see swim bladder issues. Goldfish are voracious eaters and if too much air gets sucked in, they can have positive buoyancy issues. Fish with negative buoyancy may not have enough room in their body to support a larger swim bladder. However, being negatively buoyant is much safer than positively buoyant. Fish stuck at the surface are prone to air ulcerations where the skin starts to break down by being exposed to long periods of air. External floats, such as those praised on YouTube, must be designed with the fish’s external surface in mind. Anything that rubs up against the skin will disrupt the protective mucus coat and cause secondary infection. Any float attachment will be TEMPORARY. We only apply them to get fish the surface to naturally inflate their swim bladder. We can take air out surgically, but we cannot add it in case the swim bladder ruptures. If your fish is showing signs of negative or positive buoyancy, CHECK YOUR WATER QUALITY FIRST. Only 10% of our goldfish cases are primarily caused by the swim bladder. The other 90% are water quality, diet, maintenance or bullying/trauma. Do NOT add a float without proper surgical prep in order to minimize infection.